Knowing how to craft Antimatter is key when it comes to exploring the world of No Man's Sky NEXT. In No Man’s Sky NEXT, one item players have been wondering how to get is Antimatter. This is because, in order to use your Hyperdrive and explore the world of No Man’s Sky NEXt, you’ll need to first acquire fuel in the form of Antimatter. Antimatter isn’t too difficult to find, though it certainly helps to have an idea where to look ahead of time before hunting down Antimatter. To help you out, we put together a quick guide on where to get Antimatter in No Man’s Sky NEXT! 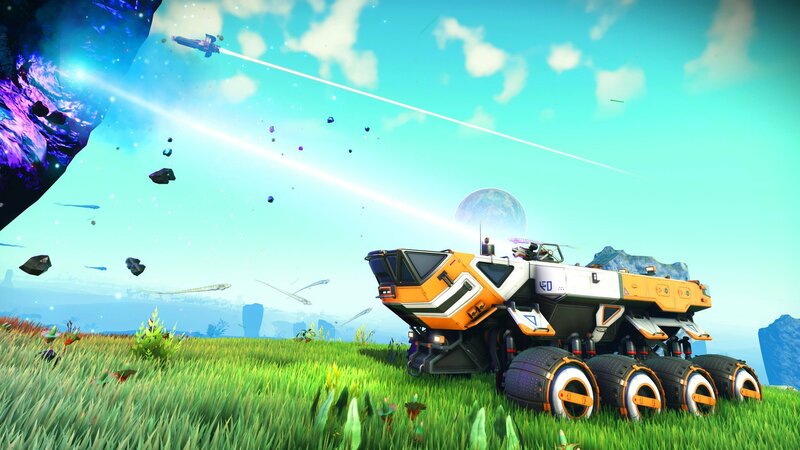 Antimatter can be used to craft Warp Cells in No Man's Sky NEXT. To get Antimatter in No Man’s Sky NEXT, you’ll first need to craft an Antimatter Housing. This is a relatively straightforward mission. After you craft your first Hyperdrive, you’ll receive a transmission instructing you to head to a new marker placed on your map. Direct your ship to this marker, then use your scanner to locate the marker and land nearby. Here, you’ll discover an abandoned building. Go inside the abandoned building and interact with the item found inside to unlock the Antimatter Housing blueprint and some Antimatter. Outside the abandoned building, you’ll also find a cluster of Whispering Eggs which can be farmed for Larval Cores. These are very valuable in terms of Units, though you’ll want to be careful when shooting them as Whispering Eggs contain dangerous Biological Horrors. 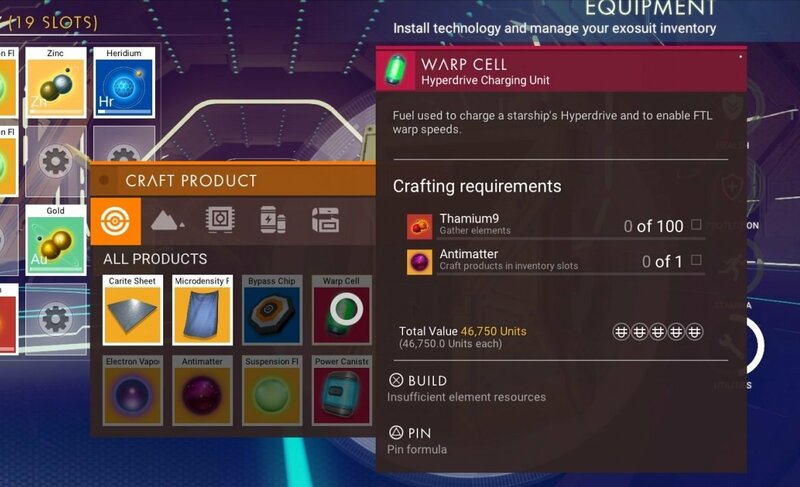 With your Antimatter Housing blueprint and starting supply of Antimatter, you’ll want to begin crafting your Antimatter Housing. Antimatter Housing can be crafted using 50 Ferrite Dust and 30 Oxygen. By crafting this Antimatter Housing, you’ll be able to combine it with Antimatter and create a Warp Cell, giving your ship enough fuel for a warp jump. By making your first warp jump, you’ll be able to find a brand new system to explore in No Man’s Sky NEXT. When your Antimatter runs out, you’ll need to craft more for your Warp Cells. Antimatter can be crafted using 25 Chromatic Metal and 20 Condensed Carbon in No Man's Sky NEXT. One critically important skill to learn in No Man’s Sky NEXT is how to craft Antimatter. To craft Antimatter, you’ll need to get your hands on the Antimatter blueprint. To obtain the Antimatter Blueprint, head to the new star system unlocked above. Here, a new beacon should come up when you scan. Head in that direction and you’ll encounter a Planetary Outpost. Talk to the aliens located at this Planetary Outpost to get the blueprint for Antimatter. To craft Antimatter, you’ll need 25 Chromatic Metal and 20 Condensed Carbon. To help, you can go back and reference our guides on how to get Chromatic Metal, and how to build and use a Portable Refiner in No Man’s Sky NEXT. By knowing how to craft Antimatter in No Man’s Sky NEXT, you’ll be able to use your ship to explore to your heart’s content. For more on No Man’s Sky NEXT, be sure to check out some of our other guides including how to get a Hermetic Seal in No Man’s Sky NEXT, how to get Solanium in No Man’s Sky NEXT, and how to get a Freighter in No Man’s Sky NEXT. By reading through this guide, you should now know how to get Antimatter in No Man’s Sky NEXT.